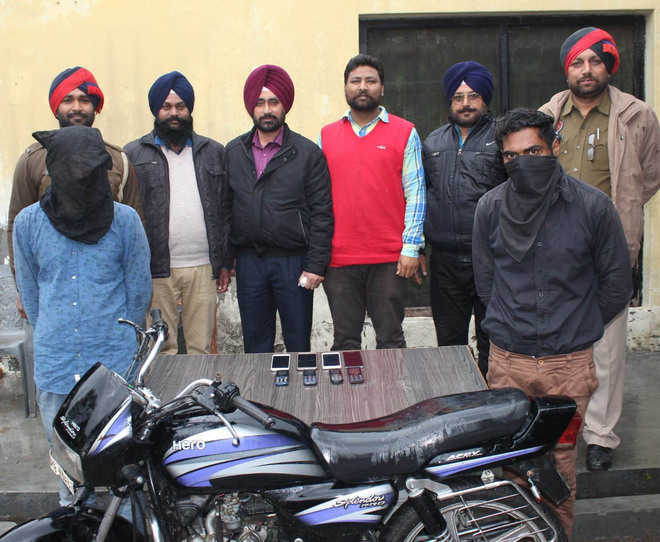 The police have arrested two alleged mobile snatchers and recovered eight stolen mobile phones from them. They have been identified as Deepk Kumar, alias Deepu, and Rahul Kumar, both residents of the Shimlapuri area in Ludhiana. The police have also confiscated a motorcycle from the accused. The police have registered a case under Section 379 B and 473 of the IPC against the suspects at the Shimlapuri police station. According to information, the suspects were arrested near Matharoo Chowk in the Shimlapuri area during checking today. The investigating officer, Sub-Inspector Ranjit Singh, said an informer had told the police about the presence of the suspects in the Shimlapuri area.